After a triumphant international tour, Vangeline Theater presents the New York Premiere of BUTOH BEETHOVEN: ECLIPSE (Admiring Tatsumi Hijikata), on October 26-31, 2016 at 8pm at The Producer's Club, Royal Theater, 358 West 44th Street, New York, NY 10036. New York Butoh dancer Vangeline conjures the ghosts of two passionate giants — Tatsumi Hijikata, founder of Butoh, and composer Ludwig van Beethoven in this hypnotic, electrifying and award-winning solo performance. 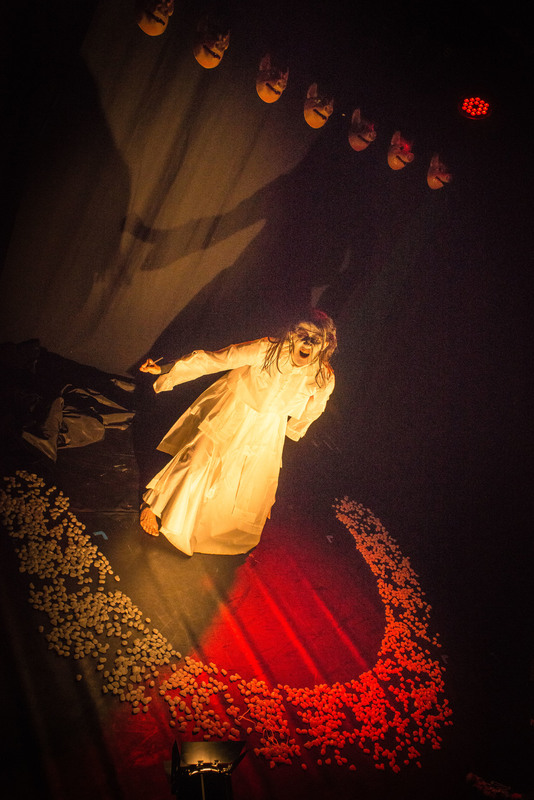 Celebrate Halloween week with the haunting art form of Butoh and come dressed in your own costume to any performance. Tickets are $20 General Admission and $18 for Students/Seniors. Closing night: Halloween! Come in costume all week! Featuring " Chanson D' Automne" interpreted by American Singer Kesang Marstrand. The word “Eclipse” is derived from the ancient Greek noun ἔκλειψις (ékleipsis), meaning “abandonment," “downfall,” or “the darkening of a heavenly body” which in turn stems from the verb ἐκλείπω (ekleípō) which means “to abandon,” “to darken,” or “to cease to exist.” Butoh is likewise the “Dance of Darkness” where performers first appear human, then as ghosts. BUTOH BEETHOVEN: ECLIPSE (Admiring Tatsumi Hijikata), is a solo piece that illuminates the darkness of Butoh with the addition of cutting edge lighting technologies such as the futuristic creations of European designer Tilen Sepič and fiber optic costume by the French company Lumigram. After touring this show for the past two years and receiving four stars at the Edinburgh Fringe Festival, five stars at Copenhagen Stage Festival and critical acclaim in the United States, Vangeline shines a new light on Butoh and will transport audiences. Tatsumi Hijikata’s costume worn for his last public solo performance in 1968 (Revolt Of The Body- Hijikata And The Japanese) is the inspiration for Vangeline’s costume created by New York designer Todd Thomas. Kesang Marstrand is an American folk singer, songwriter, and guitarist. She is best known for the single "Tibet Will Be Free" that she wrote after March 2008 riot in Tibet, in support of the non-violent resistance of the Tibetan people, and for her debut album, Bodega Rose, which was released November 21, 2008. Born in Woodstock, New York, to a Danish mother and Tibetan father. She grew up in Colorado and she later moved to New York City . Her interest in music began at an early age, as she discovered her passion for music via a piano in the common room of a schoolhouse in Colorado. Marstrand started to study and practice meditation when she was 16, and had the opportunity to spend time at Bokar Monastery in India, as well as the chance to visit Bodhgaya and Dharamsala. Berlingots de Carpentras; Bergamotes Enveloppées; Les petits Poucets de Vichy; Les Madeleines de Commercy; Les Titis de Paris; Framboise de Vichy; Assortiment de Papillotés; Les Cerises de nos vergers; Les Haricots de Tarbes; La menthe poivrée; Les Napoléons de Flandre. Publicity by Michelle Tabnick communications.